A new Hizbullah video highlights the terrorist organization's latest campaign - “liberating the Galilee.” On the agenda is Hizbullah's conquering of key sites and cities like tourist centers, refineries, and the Haifa port. 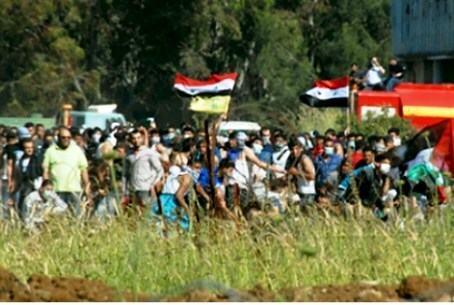 The video was posted on a Hizbullah site Monday, the same day that Israeli Arab politicians led a protest commemorating the deaths of 12 Arabs in 2000, as they rioted and attempted to spread the intifada to northern Israel. The video shows the chief “Zionist settlements” - meaning Jewish towns and cities - in northern Israel, such as Afikim, Ma'alot, and Nahariya. The video also mentions “the principal Palestinian cities in northern Palestine,” including Tzefat, Akko, Tiberias, Haifa, and Nazareth.